Michael McFadyen's Scuba Diving - HMPNGS Aitape In September 1965 the Australian Government decided to update the Royal Australian Navy (RAN) by ordering a series of new vessels. The 14 vessels ordered were patrol boats, with the intention for them to serve Australia for the next few decades. As it turned out, they served with the RAN for far less. In October 1965 an additional 6 boats were ordered. The new boats were named Attack Class Patrol Boats, named after HMAS Attack, the first to be built . The vessels were 32.6 metres long, 6.1 metres wide and displaced 146 tons at full load. The boats were powered by two 16 cylinder Davey-Paxman Ventura 16 YJCM turbo-charged diesels, each (??) of 3,460 hp, driving twin props. Maximum speed was 24 knots. They had one 40 mm gun on the bow, two 0.5 inch machine guns and one 81 mm mortar. Mines and depth charges could also be carried. The machine guns were removable and when needed, mounted at the bow and stern. The boats carried a crew of 19 men (and they were all men). A total of 20 were ordered, 15 for the Royal Australian Navy (RAN) general service and 5 for the Papua New Guinea division (then part of the RAN). The ships were built in equal numbers by two Queensland shipbuilders, Evans Deakin and Company Pty Ltd of Brisbane and Walkers Ltd of Maryborough. Built from 1967 to 1969, the new vessels were steel hulled with alloy superstructure. Other features included air conditioning, high definition radar, flare projector and high and ultra-high frequency radios. Average cost of the ships was a then A$800,000 each. Of the 20 boats, HMAS Arrow was destroyed by Cyclone Tracy which wiped out the city of Darwin, Northern Territory, on Christmas Day 1974 and HMAS Bombard and HMAS Advance appeared in the Australian Broadcasting Commission (as it was then named) TV series Patrol Boat in 1978 to 1979. Some of the boats were disposed of by donation to nearby countries, including some that were almost new. HMAS Bandolier (16/11/73) and HMAS Archer (21/10/74) were given to Indonesia on the dates shown. Five boats, HMAS Aitape, HMAS Lae HMAS Madang, HMAS Ladava and HMAS Samarai which were all part of the Papua New Guinea division of the RAN were all given to Papua New Guinea on 14 November 1974, presumably to assist them as they became a new nation the next year. Later, when the much larger Fremantle Class Patrol Boats came into service, more were donated to Indonesia, HMAS Acute (1983), HMAS Attack (1985), HMAS Barbette (1985), HMAS Bombard (1983) and HMAS Barricade (3/82). Today, HMAS Advance is on display at the National Maritime Museum at Darling Harbour, Sydney (next to the Pyrmont Bridge) and HMAS Ardent is in Darwin as a memorial. Of interest, HMAS Bayonet was scuttled off Cape Schank, Victoria on 18 October 1999. The first boat to be started was HMAS Attack which was laid down in September 1966 and launched on 8 April 1967. It was commissioned on 17 November 1967. In November 1966 the hull of HMAS Aitape was laid down at the Walkers Ltd shipyard at Maryborough. It was launched on 6 July 1967 by Mrs Maloat Paliau, wife of the member for Manus in the Papua New Guinea House of Assembly. Numbered P84, the boat was named after the Aitape area of Papua New Guinea. This is on the northern coastline and was the area devastated by a tsunami (tidal wave) after an earthquake on 17 July 1998, killing about 2,200 people. I assume that the Member for Manus also represented the Aitape area. After trials in the Hervey Bay area, the Aitape was commissioned on 13 November 1967 at Brisbane. Guests included the Queensland Governor, Sir Alan Mansfield. Therefore, although not the first completed, HMAS Aitape was the first of the Attack class patrol boats to be commissioned into the Royal Australian Navy. The first commanding officer of the Aitape was Lieutenant-Commander W. S. G. Bateman. After some work around Sydney, the vessel left for PNG on 20 December 1967 and arrived at Manus Island (off the northern coastline) sometime in January 1968. The crew of the new boat included five PNG members of the RAN. In mid-1968 her sistership HMAS Lae arrived at Manus. The Aitape was the senior ship of the Papua New Guinea division. 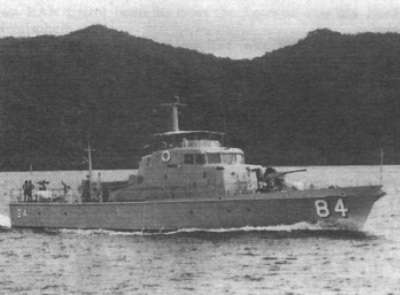 In February 1969 Aitape arrested a Taiwanese fishing vessel operating within the Territory's waters and towed it to Lae. On 18 February 1969, HMAS Aitape and HMAS Ladava, another new patrol boat, entered the massive Sepik River and over the next three days they travelled over 370 kilometres up the river as far as Ambunti. Depths on the river were recorded as over 39 metres. The trip was a bit hazardous, as many logs were encountered, being swept downstream at speeds of up to five knots (almost 10 km/h). The next month, on 5 March 1969, the Aitape and Lae made history when they became the first Australian patrol boats to cross the Equator on a voyage to Pohnepei and Chuuk in the (now) Federated States of Micronesia. They were also the first Navy boats with PNG crew to cross the Equator. The Aitape was certainly busy in 1969 as in the middle of the year (with Ladava) she landed troops on islands in the Milne Bay area. The next year started off with excitement when 12 survivors of an Indonesian vessel, Averius, were rescued. The ship had hit a reef 192 kilometres north of Wewak. During April and May 1970 Aitape visited outlying islands in the Solomon Islands. The skipper was now Commander J. Lattin. In December 1970 the Aitape set out on an adventure that must have been a fantastic trip. Together with Ladava, she entered the Fly River and navigated 795 kilometres to Kiunga. They returned to Port Moresby on 17 December 1970. January 1971 saw Lieutenant-Commander Jim Yates (not Yeates as I have read) was skipper and the Aitape rescued the crew of the MV Wailawa, a 15 metre vessel, from Long Island (to the east of Madang). In March 1971, the Aitape and another sistership, HMAS Samarai, escorted the Royal Yacht Britannia, from Manus Island to Madang. On board was the Duke of Edinburgh. The above photograph was taken from the Royal Yacht south of Lae on the Way to Madang. These boats visited the new town of Alotau in Milne Bay the next month. After a refit in Sydney, the Aitape returned to PNG in February 1972 under the command of Lieutenant-Commander K. J. Heynatz. 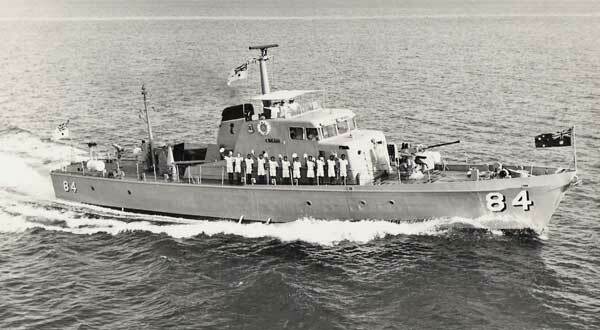 In March 1972 she was one of 10 patrol boats that participated with HMAS Anzac in Exercise panti Manua (pidgin for Many Warships) in the Milne Bay area. After Cyclone Hannah devastated the north-east coast of Papua and Aitape (with Ladava) transported stores and medical supplies to the area. In August 1972, Aitape again entered the Sepik River, this time with Samarai. Again, they travelled to Ambunti. On 17 and 18 September 1972, Aitape arrested four Taiwanese fishing vessels. In November 1972, Aitape again entered the Fly River, this time with Lae. In early 1973,, Lieutenant-Commander Mike Bennett took over command of the Aitape and in March 1973 with Samarai, she moved troops on exercise in the Samarai area. From July to September 1973 the Aitape underwent a refit in Cairns, returning to her base at Manus Island on 8 October 1973. On 14 November 1974, Aitape was transferred to Papua New Guinea and renamed HMPNGS Aitape (Her Majesty's Papua New Guinea Ship)> Papua New Guinea was to become a sovereign nation on 15 September 1975. The boat served in the Papua New Guinea Defence Force till she was paid off in 1982. As she was the first of PNG's patrol boats to be paid off, she was used for spares for the other boats. After this, she stood around in Port Moresby Harbour for many years. Finally, in 1995 she was sunk as a dive site. 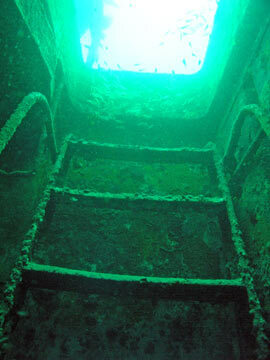 Today the wreck is located south-east of Port Moresby Harbour, on the inside of the reef that protects the coast. It is buoyed (located a few metres below the surface). As you descend the mooring line you will see huge numbers of very large fish. They are everywhere. Big trevally, mangrove jacks, sweetlips, batfish and other species. The mooring is attached to the stern of the boat, which is 27 metres. First thing to do is drop over the rear railing and have a look at the props. The two props and the rudders are clearly seen. Each prop has two of the four blades showing. Going back to the deck, you will see a number of hatches. The rear most one leads to a stern compartment and can be entered. Be aware, though, that all are quite tight squeezes and there is a lot of wiring and cables hanging down everywhere (no tidying up of the boat appears to have occurred before it was scuttled). The next hatch is more interesting, enabling a bit of exploration. You can enter and swim forward a bit but it soon comes to an end as there is a bulkhead. Going back along the deck you will see another hatch, this gives access to a larger section of boat. 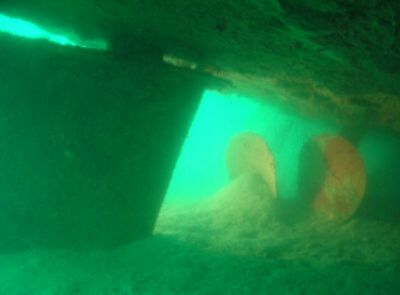 The depth inside the hull is about 28 to 29 metres. You can swim along inside exploring for a couple of minutes. 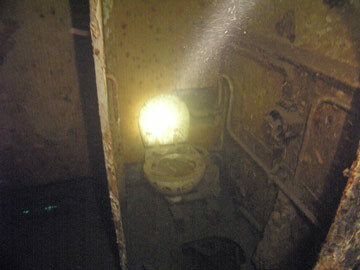 You will see a toilet and other interesting things. Do not forget a torch, you will need it as it is very dark. Exit the wreck here and you will be just behind the bridge. Enter the upper bridge area, the depth is about 25 to 26 metres. You will see that all portable items have been removed, probably back when it was put into mothballs, and used for the remaining PNG patrol boats. You can exit out the large windows or the other side of the boat. Moving forward again and dropping back to the deck, There is another hatch here, giving access to crew compartment areas. The mount for the 44 mm gun is near here and further forward a winch. You can drop over the bow and this makes a good photographic opportunity. Depth here is also 30 metres. Return back to the stern via the opposite side of the boat and examine the superstructure above the bridge. You will see the two funnels as you go. You have probably been down now about 20 minutes and will soon be entering decompression. If you do not want to enter deco, ascend now. Otherwise, stay a few more minutes examining the outside of the boat as well as the prolific fishlife. 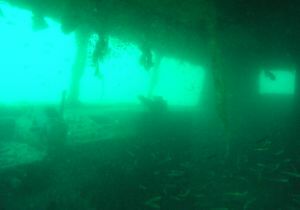 This is a nice easy dive, with an interesting wreck and good fishlife. Visibility when I dived was not too good but it normally averages 10 to 15 metres. Water temperature was 26°.